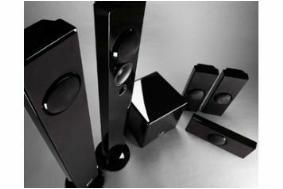 Cabasse launches PHI high-end range of home cinema speakers | What Hi-Fi? Looking elegant in a piano black finish, the PHI range consists of a floorstanding speaker, a satellite speaker and the Santorin 21 subwoofer. The speakers use a '2½ way design', with treble and midrange signals being reproduced by a coaxial midrange/tweeter driver, while low frequencies are shared between the coaxial unit's bass driver and the separate 100mm driver. The speakers can be arranged in a system of the consumer's choosing, whether 2.1 or 5.1, and we have a system of our own winging its way over to us for review – so look out for that. The Cabasse PHI floorstanding speakers will set you back £899 per pair the PHI satellites costs £359 each, while the Santorin 21 subwoofer is yours for £549.